Fridge raiding in the middle of the night is just a side issue in today's installment of the Circadian Rhtythmicity Series that revolves around Intermittent Fasting with different macronutrient ratios and its effects on body weight, body fat, liver fat and the expression of circadian clock genes. Everyone who's also following my posts on facebook will probably be aware that (a) I don't miss a single opportunity to kiddingly refer to scientists and journalists reading this series, whenever I point you towards a new paper or news item about circadian rhythmicity. He (or she) will yet also be aware that (b) one of the studies, I actually postponed to this installment of the series, made the rounds as of late, as the ScienceDaily piece on it - which was basically a "copy & paste job" of the EurekaAlert! press release - gave the impression that a "time-restricted" (others would call it "intermittent fasting") high fat diet would be superior to the carbohydrate-laden standard rodent chow, as far as the body compositional outcomes are concerned. I wrote and talked about this on facebook, as well as the SuppVersity Science News Roundup on Super Human Radio, last Thursday. Anyways,... today, I am going to deliver on my promise from two weeks ago and will eventually discuss the results of the Sherman study (Sherman. 2012) and the influence of nutrient timing and composition on the mammalian circadian rhythm in detail. As I have already pointed out in the "Break-Fast Installment" of this series, it is, at least from a circadian perspective, actually not a question of whether or not you should "fast", but more or less only one of how long this fast should last. An exact answer to this question has not yet been found, though, and I would even bet money that it never will, simply because it depends on too many confounding and highly individual (epi-)genetic and lifestyle factors. And still, based on what we know now, one thing can be said for sure: If you are standing up in the middle of the night either voluntarily or because whatever pathology may be driving you and have a protein shake or ransack the fridge, you have a problem. A psychological one in the first case, a physiological and probably clock-gene related one in the latter case. *Always keep in mind: Mice are nocturnal animals, they start to party with pubertal humans (though this is meant as a joke, I suggest you take a look at my additions to figure 5, before you totally discard it as insignificant), when the lights go out. It is therefore only natural to restricting their food-intake to the so-called dark-phase - just as natural as not ransacking the fridge in the middle of the night would be for a normal human being! "[...] although body weight and epididymal fat mass were 20 and 48% lower, respectively, in the RF-HF group than in the AL-HF group, liver lipid content was not significantly different between these groups." In view of the role a "fatty" and thus malfunctioning liver plays in the etiology of the metabolic syndrome, it can therefore not be said that the high fat diet, respectively the incarnation of the latter that was used in the study at hand, is either healthy or anti-obesogenic. After all, the increase in visceral and liver fat, of which only the former was slightly blunted in the study at hand, usually precede the development of the other classic features of a conglomerate of metabolic ailments, we usually refer to as "metabolic syndrome". 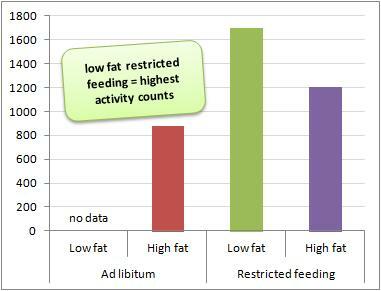 Against that background, it is of questionable value that the overall body weight of the "intermittendly fasted" (=restricted feeding, short RF) rodents on the intentionally fattening "high fat diet" (HF) that contained 42% of the energy in the form of soybean oil and palm sterate, was lower than that of their peers on the ad-libitum (AL) high or low fat diets (AL-LF, AL-HF). And while the macronutrient and fatty acid composition of the diets does not allow for any definitive statements assertions about the value of real low carb diets with ~80% of the energy from fat, the data in figure 2 illustrates a couple of metabolically relevant differences that arose as a result of the different macronutrient composition of the diets (please remember that I plotted only values with significant inter-group differences between low and high fat groups, yet not those difference, which are attributable solely to the intermittent feeding / fasting regimen and have no relation to the macronutrient composition). While the overall image that emerges here, i.e. the ability of a timed feeding regimen (aka intermittent fasting) to rectify and/or advance the peripheral (here, hepatic) shifts induced by the HF diet, is pretty obvious, our understanding of the interactions of the individual clock genes is still too premature to say something definitive about the implications of the registered changes. "So what's that supposed to mean, now? Is fasting good? Is fat bad? ... or what?" No effect of macros? In as much as these observations support that restricted feeding aka intermittent fasting alone can reverse the majority of negative effects on the peripheral expression of clock genes, it says nothing about their central expression (all values here were measured in the liver!) and the effects on body composition. The increase in pAMPK, for example speaks in favor of the low fat diet. The same is true for the potential longevity effects. Plus, it is essentially pointless to speculate about the best macronutrient ratios, as long as a clone of the fattening standard American diet, of which I do simply assume no one of you will truly believe that it would deliver better results than a low fat diet in a rodent model, is all we can compare the low fat approach to intermittent fasting to (read more on the practical side of things in the next installment). The RF-LF diet led to increased levels of pAMPK and pACC, indicating intracellular low energy levels, inhibition of fatty acid synthesis and increased fatty acid oxidation. The AL-HF diet down-regulated AMPK, ACC and SIRT1 daily protein levels by 50% compared with AL-LF mice. The timed HF diet led to 37% lower levels of pAMPK than those in the RF-LF group and 62% increased pACC levels compared with the AL-LF group, indicating adequate energy levels but reduced fatty acid synthesis . The RF-HF diet also increased daily levels of PPARα mRNA. when you eat is of greater importance, than what you eat! On a basic level, the circadian clock can be divided into 2 parts: the central clock, residing in the suprachiasmatic nucleus (SCN) of the brain, and the peripheral clocks that are present in nearly every tissue and organ system tested. Light enters through the retina of the eye, causing electrical signals to pass through the retinal hypothalamic tract, which are converted to chemical signals in the SCN. 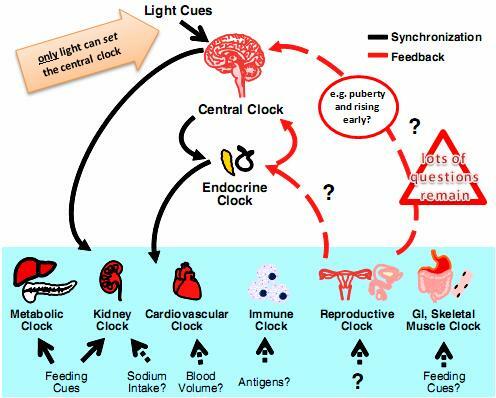 Light signals and other physiological factors, such as feeding cues, entrain the central circadian clock. There has been much debate among chronobiologists about the relationship between the central clock and the peripheral clock with 2 major theories emerging. "orchestra" model according to which the multiple peripheral clocks are like the members of an orchestra, with each of them playing its own "instrument"
If you don't want the metabolic concert of your body to end up as a cacophonous cat's concert as in "David Teniers the Younger Cat concert" (see image), you better make sure that all the member's of it's orchestrate are in time with the director, the central and light dependent circadian clock in the suprachiasmatic nucleus of your hypothalamus. The "orchestra" model has the beauty of ascribing greater importance to the previously discussed effects of feeding-times and (macro-)nutrient composition - a position that is backed up by the majority of recent studies, by the way (Richard. 2012). In other words, while your "peripheral clock", e.g. the clock of your fatty acid metabolism in your liver can go wrong, you better make sure that it does not, because in the end, it does not really matter how "independent" each of the members of an orchestra may be. When they start playing, their synchronization by the director, or, analogously, appropriate light cues determines whether the overall outcome of this intricate metabolic concert is a symphony and their concert hall, i.e. you(!) lean & healthy or a cacophonous mess that's making you fat & sick! Light over Food Timing & Food Timing over Food Types. On that note: Screens out for today, folks! Hebrew University of Jerusalem. "A carefully scheduled high-fat diet resets metabolism and prevents obesity, researchers find." ScienceDaily, 12 Sep. 2012. Web. 16 Sep. 2012. Richards J, Gumz ML. 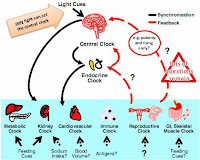 Advances in understanding the peripheral circadian clocks. FASEB J. 2012 Sep;26(9):3602-13. 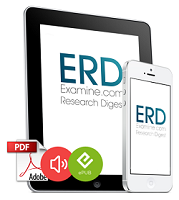 Epub 2012 Jun 1. Sherman H, Genzer Y, Cohen R, Chapnik N, Madar Z, Froy O. Timed high-fat diet resets circadian metabolism and prevents obesity. FASEB J. 2012 Aug;26(8):3493-502.